Barnardo’s NI in partnership with the CYPSP Ards and North Down Locality Planning Group and South Eastern Health and Social Care Trust hosted a one day training workshop on the Botvin Life Skills Programme to support teachers to build the resilience of their young people in the classroom. Lauren Spiers, Barnardo’s Facilitator spoke from the programme and said “LifeSkills is a highly evidence based, universal programme that improves children’s emotional health and wellbeing within the classroom setting. On 23 August teachers within the North Down and Ards area completed the Botvin LifeSkills training in Bloomfield Primary School. 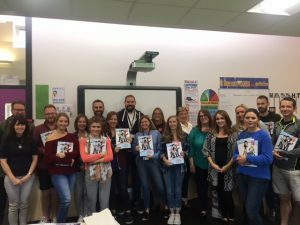 Teachers in primary 5, 6 and 7 learned the core components behind the programme’s success and how to effectively implement LifeSkills within their school. A benefit of the programme is that it can clearly demonstrate the impact the programme is having with regards to children’s skills, knowledge and attitude. This entry was posted in ArdsnorthdownLPG, News, South Eastern Outcomes Group and tagged ardsnorthdown-lpg, news/events, southeastern-og by Stephanie Thompson. Bookmark the permalink.